NPR News Nuggets: Missing Cookies, A First Date Horror Story & Presidential Photobomb Here's a quick roundup of some of the mini-moments you may have missed on this week's Morning Edition. A Kentucky woman made off with $15,000 worth of Girl Scout cookies. She and the cookies are missing. Any cookie detectives out there? You're probably familiar enough with the nursery rhyme "Who Stole The Cookie From The Cookie Jar?" that you can sing along with it. However, today's case is a bit more sinister and we know who stole the cookies. 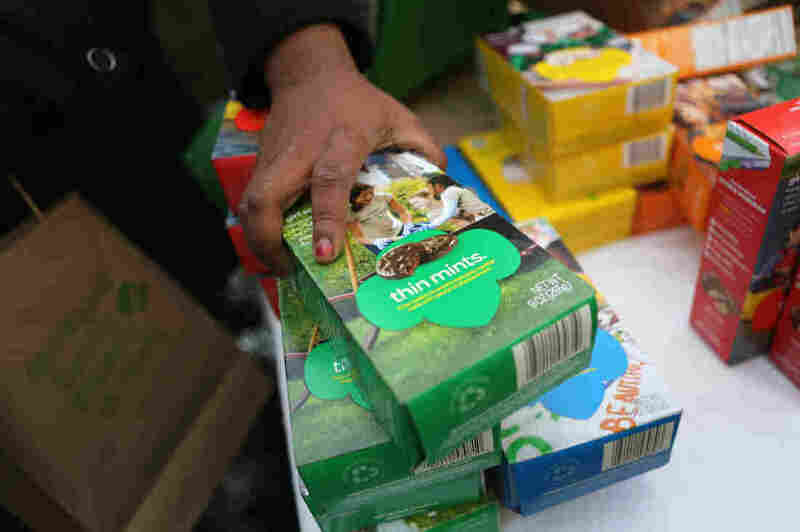 As Morning Edition host Rachel Martin said on Monday, $15,000 worth of Girl Scout cookies were stolen in February by a troop leader in Kentucky. Earlier this month, Leah Ann Vick, 26, was indicted for felony theft for the cookies that, along with Vick, have vanished. Under the Girl Scout cookie business model, the cookies are picked up and sold by the scouts and then paid for after the sales, so the troops are not limited by paying upfront for them. Girl Scout law states that members of the organization will be "honest and fair," and "respect authority," among other things. Those values, as well as the others the organization works to instill in young women, do not seem to have had an effect on the young leader. It's an understatement to say that Girl Scout cookies are a treat, but even as delicious as they are, they still have a shelf life. If you want to make them last until the next season, a freezer is a necessity. Do we think Vick has a freezer big enough to store $15,000 worth of cookies? Is there anything worse than being hungry or angry? Yes, being both at the same time. It's called being "hangry" and it is a real issue, but one that pizza can fix. As Morning Edition host David Greene said on Tuesday, pizza, or rather one brave pizza delivery man, came to the rescue of some hangry Amtrak passengers on Sunday. On its way from Boston to Washington, D.C., a train got stranded in Wilmington, Del. The train sat on the tracks for three hours and some smart hangry passengers decided they needed a hero to save them and thankfully, they did not call Chad Kroeger. Instead, they called Dom. Dom's Pizzeria is in Delaware and the restaurant specialize in New York-style pizza. As The Washington Post reports, when the order came in for a delivery to a stuck train, the clerk was wary, but Jim Leary stepped in. Leary has been a pizza delivery man for 18 years. In the 18 states, 28 counties and three parishes Leary has worked, he told the Post he had never delivered a pizza to a train. Leary wandered along the creek by the tracks before he finally found the passengers. As you might imagine, Amtrak was not amused and called the delivery "extremely dangerous," and hopes such a feat is not tried again. The first rule of watching movies is no talking during the movie. The second rule of watching movies is no talking during the movie. Third rule: If you take someone on a date to the movies and they start texting, sue them. Now while those might not be the tried-and-true rules of going to the movies, they just might be those of Austin, Texas, resident Brandon Vezmar. Vezmar got a lot of attention this past week when he decided to sue a woman he took to the movies, whom he said texted on her phone the entire time. As Morning Edition host David Greene said on Wednesday, the pair went to see Guardians of the Galaxy Vol. 2 on what would appear to be a date from hell based on Vezmar's description. He said that the woman, Crystal Cruz, was sending text messages throughout the entire movie. Vezmar told the Austin American-Statesman that texting during movies is one of his pet peeves and after he asked her to stop, she left the movie altogether and took her car with her. The lawsuit asked Cruz to refund Vezmar $17.31, the cost of one 3D movie ticket. He said he filed the case to bring more attention to the issue of texting during movies. After the details of the date became national news, Cruz put the case to rest during an interview with Inside Edition. The Statesman reports she paid Vezmar the price of the ticket and he agreed to drop the case. 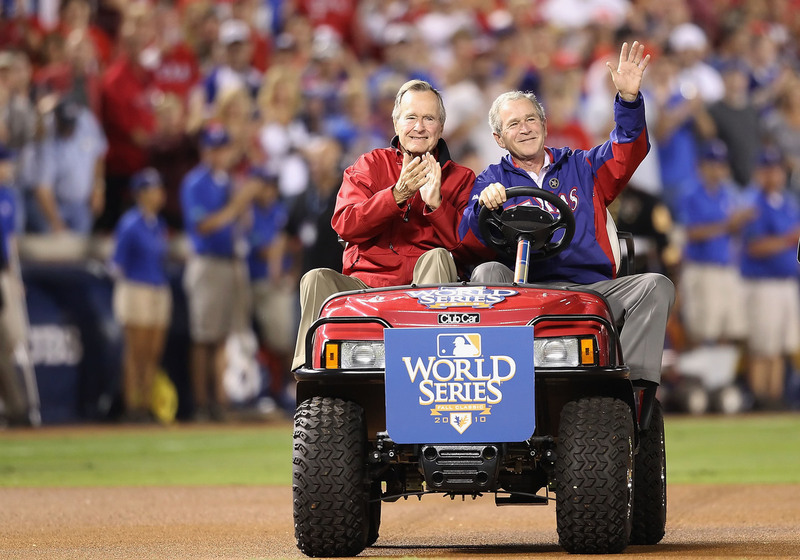 Former President George W. Bush has been going to Texas Rangers games for years, but during a game on Wednesday he made a cameo in a segment FOX Sports reporter Emily Jones was taping, yelling "Hey!" as he walked by. Who can resist a good photobomb opportunity? The answer is most certainly not former president George W. Bush. He made this clear during a Texas Rangers baseball game on Wednesday night. As Morning Edition host David Greene said on Friday, FOX Sports reporter Emily Jones was doing her job, talking about one of the players on TV, and a fan came up behind her and yelled "Hey!" That fan was none other than the 43rd president of the United States. Jones wasn't fazed by the famous fan and went about her report. Later she said that it was her "most favorite photo bomb ever!" Bush saw an opportunity and he took it, even though he might once again become "a national tweet sensation." You might remember he was also in the news after President Trump's inauguration when his attempts to put on a poncho did not go as smoothly as he might have hoped. Bush has said he regrets that happening, but none of us do. After the poncho snafu Bush said one of his daughters warned him saying "Dad you're, you know, a national tweet sensation or whatever they say. You know, you're trending or whatever the words are." Tweet sensation, national treasure — they're basically the same.